My post on the “Shifting Locus of Economic Activity in NH” back in January generated a lot of interest and emails. That post has more views than any other post on this blog over the past year and half. Admittedly that’s setting a pretty low bar as far as blog readership honors go. Nevertheless I want to thank my family as well as those with an interest in flying, swarming insects and an inability to spell “locust” in their search engines for making it possible. As I noted in my first post on the topic, I believe there are a number of economic and demographic indicators that support my contention about the shift in economic activity. Still, there are some (many?) in the Granite State who disagree. In the spirit of giving the public what it wants and sparking debate, I present another of what will be several posts on the topic. Some themes essential to my thesis are: that the ability to attract and retain talent (skilled individuals with higher levels of educational attainment) is the critical ingredient responsible for the shifting of activity in NH – as well as the key ingredient for producing a dynamic economy anywhere; and that communities offering amenities and services desirable to “talent” and at a relatively more affordable price are keys to attracting talent. I think price (the ability to offer desirable amenities and services at a relatively more affordable price lower than other communities that offer similar amenities) has been important. But I also think that patterns of economic activity in NH and throughout the country demonstrate that unless your community or state is sitting on a valuable store of fossil fuels or minerals, being cheaper isn’t enough to generate more robust economic activity. One interesting artifact of the debate over local government fiscal policies is the mistaken belief that communities spend more when they contain a higher percentage of lower-income residents. In fact, just the opposite is true – expectations for services, quality, and amenities, along with their costs, generally rise as communities (primarily cities – small and large) generate more economic activity and become wealthier. This typically creates a lot of conflict in communities that are experiencing new economic successes and associated demographic changes and can make sustaining a higher level of economic activity difficult for a community. Getting back to the evidence that supports my contention about economic activity in NH, the previous decade has not been kind to NH or most states in terms of job growth. I documented the Seacoast’s increasing share of NH’s employment and in key industries in my prior post on the topic. Here, and in future posts, I will look at some of the demographics of that job growth to support my thesis. The chart below shows the percentage change in jobs among individuals of all educational levels (age 25 and up) in different counties and the State of NH between 2003 and 2012, as well as the percentage of jobs held by individuals with at least a BA degree. Similar to my prior post, the chart shows that job growth has been higher in the Seacoast (defined here as Strafford and Rockingham Counties because of data availability while the prior post used data at the community level) than in either Hillsborough County or the State as a whole. 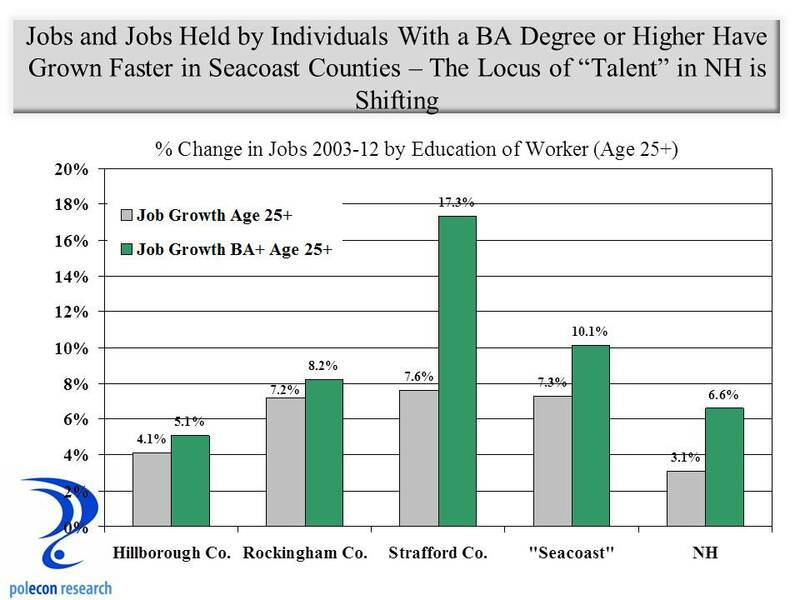 More importantly, the chart shows that the rate of job growth in the Seacoast among those with at least a BA degree has exceeded the rates for either Hillsborough County or the State by an even wider margin. Strafford County has seen an especially large increase (largely in Dover – my domicile in the interests of full disclosure) but its much smaller employment base makes larger percentage changes easier to obtain. Again, however, it is not just job growth but the nature of that growth and the shifting of talent that is the key. The Seacoast accounted for a higher percentage of the state’s net job growth between 2003 and 2012 (chart below). The percentage of the state’s net job growth accounted for by the Seacoast was 70% compared to 46% for Hillsborough County (note the percentages add to more than 100% because some counties had negative job growth during the time period). Almost half of the net job growth in NH among workers with a BA degree occurred in the Seacoast. Hillsborough County still has a larger percentage of job holders in the state with a BA degree or higher (37% to 31% in the Seacoast) but that percentage has slipped by almost 1% over the time period, while the Seacoast’s percentage has increased by 1%. Still even shifts occurring at seemingly glacial speed are very powerful. I suppose it is possible that the Seacoast has just been more successful in adding jobs which overqualified BA’s are filling. Based on my initial examination of job growth by industry, I don’t think that accounts for the relative differences, but in future posts I will examine that and other possibilities. This entry was posted on April 17, 2014 at 10:58 am and is filed under Demographics, Educational Attainment, job growth, New Hampshire, NH, NH Economy. You can subscribe via RSS 2.0 feed to this post's comments. It would be interesting to build upon your last post to see how many nonprofit/service organizations are in the region compared to ten years ago (or if these organizations are growing in terms of staff/budget). Just in case you have any extra free time, Brian! To build upon this and your last post, it would be interesting to see what service/restaurant/nonprofit sectors are moving to the area to meet the demand. Or, if these already existed, is there an increase in staff/budgets? Just something fun to consider in your free time, Brian! There is a research project in that for sure. Probably not one that anyone would fund however (that is the way it is with a lot of my research topics and interests) but here’s the deal – you find the funders and I will answer all of those intriguing queries you can think of!